I've mentioned that at the end of September, October, November and December, I'd be awarding PRIZES. This month, I'm happy to announce that my co-judge is I'M BORED author, Michael Ian Black. We've chosen four winners, each of whom wins a hand-drawn doodle by me (Debbie Ridpath Ohi) plus an I'M BORED fridge magnet. Please note that judging criteria is shamelessly subjective. I'm also giving out one Special Geographic Award; see below for details. I melted when I saw this photo because it was the first photo of an adult reading I'M BORED to a child. 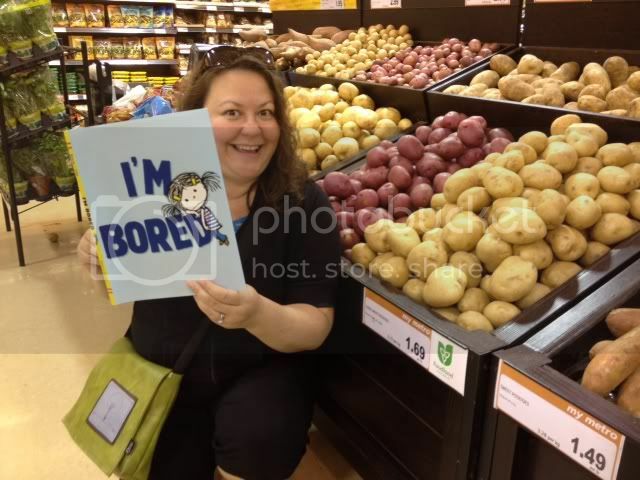 Plus I loved the caption that went with the photo: "5-year-old when sharing I'M BORED with Dad: 'I'll be the potato. And the flamingo. You be the girl.'" Contributed by Kate Pohl Dopirak. Tina The Lizard with I'M BORED in NY. Photo contributed by John Brooks. Michael's comment: "How can you not love a lizard?" Above: A Boring Tea Party With A Potato In Arizona. I LOVE the expression on the girl's face, plus the setting is so fun. And a Special Geographical Bonus Prize goes to Glen Rutland, whose Bored photo taken in Yellowknife, Northwest Territories is definitely the northernmost Gallery contribution! Congrats to all the winners! I'll be contacting each of you for snailmail info so I can mail you your prizes. You can see the other photos in the I'M BORED In The Wild Gallery on Pinterest. I'll be giving out more prizes at the end of October; read the submission guidelines online. If you want your own I'M BORED fridge magnet or other I'M BORED swag, do visit the I'M BORED shop on Zazzle. All profits will go to Breaking The Chain, a nonprofit literacy cause founded by Riley Carney. Breaking The Chain works to put new books in high-risk, high-need elementary and middle schools.